Dreamfields Pasta has the same delicious taste and texture of traditional pasta but and one-cup of cooked Dreamfields pasts (2 oz. dry) has 5 grams of fiber and 7 grams of protein. It is made with premium durum wheat semolina and that is why the texture and the taste is so familiar and so good. I also learned that Dreamfields unique recipe contains inulin, a prebiotic fiber sourced from chicory root, which helps promote healthy digestion. In addition to the Angel Hair pasta I used in my recipe, Dreamfields also offers Elbows, Penne Rigate, Rigatoni, Spaghetti, Linguine, and Lasagna. Which type is your favorite? Who wants to heat up the oven on a summer night? Not me! In the summertime, I love to make pasta for dinner and then enjoy it again the next day as a cold pasta salad. It’s fast, it’s easy and the whole family loves it. 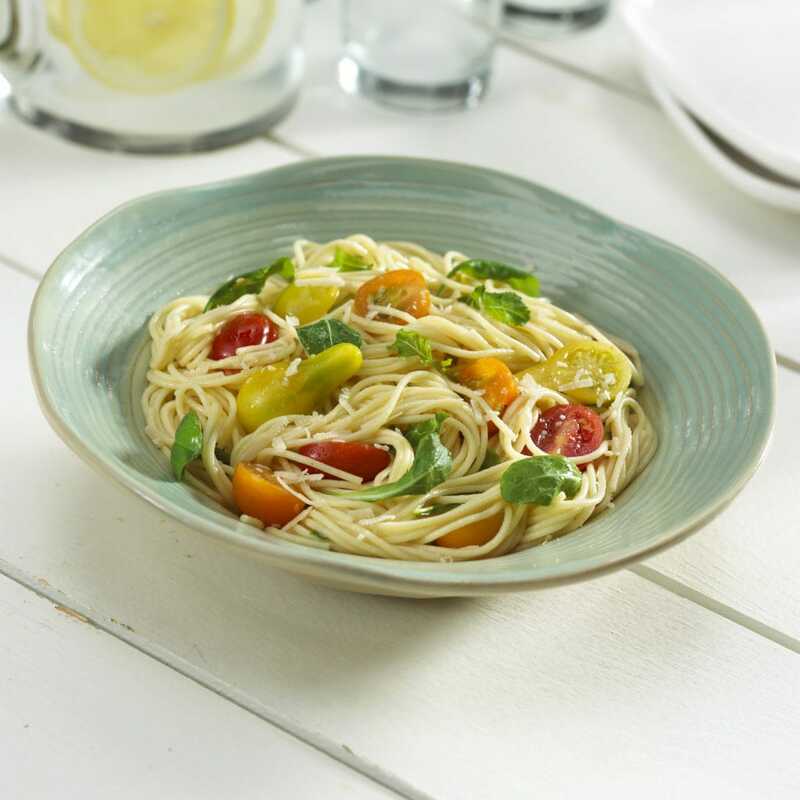 This Angel Hair & Fresh Tomato Toss recipe is perfect to take along and enjoy at outdoor concerts and picnics. Just toss together some Dreamfields Angel hair pasta with alimony vinaigrette and add in some arugula, tomatoes and Parmesan cheese . . . maybe some pine nuts if you’re in the mood. That’s it. Click here for the entire recipe. This is a sponsored post from Dreamfields pasta and all opinions are 100% mine. I love the idea of eating healthy pasta. The thought of a pasta with 5 grams of fiber and 7 grams of protein plus the inulin to promote healthy digestion is so appealing to me. That looks so fresh and delicious! I cannot wait to try it out! Saving this recipe for later.